FARGO, N.D. — Zach Faremouth scored twice and was one of nine Force players to tally a point in a 5-2 win over the Central Illinois Flying Aces in front of 3,890 fans Saturday night at Scheels Arena. The series sweep of the Flying Aces moves the Force within one point of Des Moines for fourth place in the Western Conference. Central Illinois’ Tyler Gratton opened the game’s scoring for the second straight night with a breakaway goal at 10:59 of the first period. Gratton followed his goal up with a celebration directed at the Force players and fans. 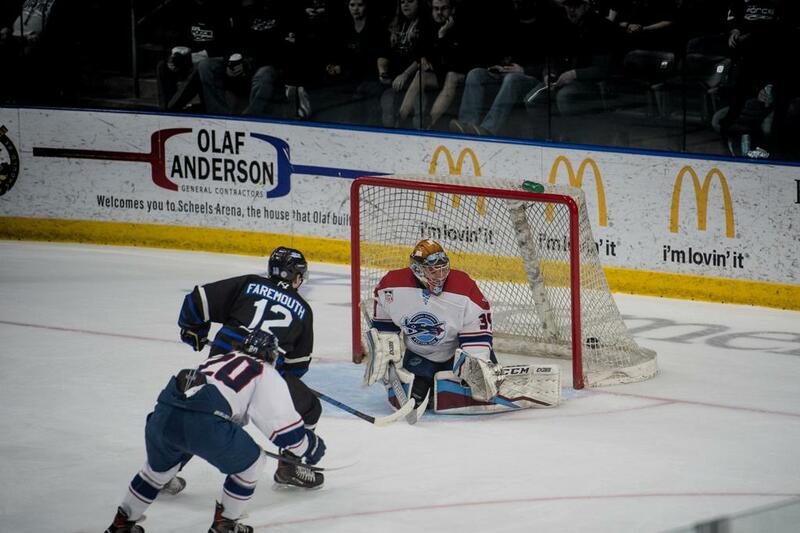 Fargo responded by scoring three goals in 1:22 to go from 1-0 down to 3-1 up by the end of the first period. Mike Kesselring tied the game at one when he grabbed his own rebound in front of the net and buried the second chance for his eighth goal of the year at 13:19 of the first period. Jeremy Davidson and Justin Lee assisted on the play. Exactly one minute later, Zach Faremouth beat the Central Illinois goalie with a shot to the five-hole for his fifth goal of the year and second in as many games. Ondrej Pavel and Tristan Broz each grabbed helpers on the goal that gave Fargo its first lead of the game. The Force got a break on the ensuing shift after Faremouth’s goal when a dump in attempt ricocheted off the glass behind the Central Illinois goal and caromed in front of an empty net. Christoffer Bjork was there to collect the puck and dodge a sprawling Flying Ace goalie before depositing a backhand into the empty net for his sixth goal of the year. Spencer Cox picked up his first career USHL point with the lone assist on the play. Central Illinois got back within a goal when they scored just under five minutes into the middle frame, but the Force responded again when Faremouth won a battle in front of the net and flicked a shot off the crossbar and down into the goal. Tristan Broz picked up his third assist of the weekend on the goal at 8:11 of the second period. The Flying Aces had a chance to get back within a goal midway through the period when they were awarded a penalty shot, but Ryan Bischel got a toe on the puck before it clanked off the right post and out. Bischel stopped 28 of 30 shots he faced to earn his 26th win of the season. Jeremy Davidson added an insurance goal against his former team on the power play late in the third when he banged home a pass from Hank Crone at the top of the Central Illinois crease with 8:54 left in regulation. Crone and Kesselring picked up assists on the play, Davidson’s 20th goal of the season. The Force jump to 30-21-4 on the year with the win and will look to finish the weekend unbeaten when they travel to face off with the Sioux City Musketeers tomorrow night in Sioux City. Fargo can move into fourth place in the Western Conference with a win. Puck drop for the Force-Musketeers matchup is set for 5:05 p.m. Sunday night.